In 1987, Nancy’s Homemade Fudge founder, Nancy Galli, was trying to satisfy her sweet tooth at her home in Meadows of Dan. She imagined chocolate fudge that was full of chocolate flavor, not too sweet, and just the right texture. Lots of trial and error in her kitchen resulted in her original recipe fudge. But she didn’t stop there. Nancy wanted to create stimulating, rewarding jobs for her rural Appalachian community of Meadows of Dan (population: 500). With that dream in mind, she began her candy business. Enlisting the help of friends and neighbors, Nancy’s Homemade Fudge began making fudge and selling it to stores in Virginia and North Carolina. People loved the taste! In 1989, Nancy developed the company’s signature Fudge Cup in the most popular Peanut Butter Chocolate flavor. She began exhibiting at national trade shows and selling her confections nationwide. Everyone loved her fudge so much and urged Nancy to create more candies. Chocolate covered pretzels came next. Then Chocolate Nut Clusters. Then Peanut Brittle. Nancy found that her sweet tooth was great inspiration for her. Her company’s line of fudges, chocolates, and other candies grew. In 1998, Nancy’s Homemade Fudge outgrew the kitchen and warehouse space they had been renting. And with such a wide selection of handmade confections, Nancy changed the business name to Nancy’s Candy Company. Nancy purchased 4.5 acres at the intersection of The Blue Ridge Parkway and built a 30,000 square foot facility to house her kitchen, warehouse, offices, shipping, and a factory outlet store. 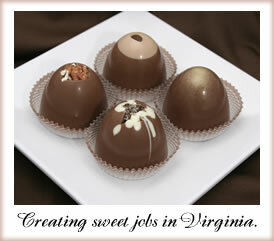 In 2009, Nancy added wonderful artisan truffles and a new family of chocolates called N Collection. Each mouth watering truffle is hand molded, hand painted and has incredible flavor combinations. Customers loved all of our original recipe confections so much, that in 2008 we opened our retail store in Floyd, VA .
Today you can visit and taste over 45 different flavors of fudge, more than 80 mouthwatering chocolates, 20 amazing N Collection artisan chocolates, and more candy than you can imagine. That big sweet tooth is still motivation for new, original recipe candies being developed all the time. Sometimes, customers in the factory outlet store see the same smiling woman eating chocolate everyday– that’s Nancy!